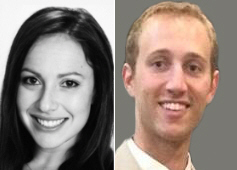 US-based sampling firm InnovateMR has promoted Amanda Keller-Grill to VP of Product Strategy and Jake Leal to Director of Platform Solutions, and has launched new features for its Pegasus self-serve platform. Keller-Grill (pictured left) has been with the company for nearly five years, most recently as VP of Global Client Service, and worked previously as Team Lead, Operations at Cint. Prior to joining Cint in late 2011 she spent eighteen months as a Project Manager at Toluna. Leal (pictured right) joined the firm a year ago, having earlier worked as an Account Executive at FocusVision and before that as a Manager at retail giant Target. InnovateMR co-founder and MD Matt Dusig comments: 'Amanda's knowledge of surveying and sampling is unparalleled. She possesses the perfect combination of know-how, creativity and vision to steer future products for InnovateMR'. Company President Michael Anderson adds, 'Jake brings a wealth of technical and commercial expertise that is essential to support our clients and their need to have speed, global respondent access and on demand sampling controls all at their fingertips'. easier audience targeting; creation of census rep targeting and quotas, and create custom screening questions; and viewing of real-time updates to feasibility and pricing as a target audience is built. Web sites: www.innovatemr.com and www.pegasusmr.com .